I worked a few more variations of this stitch. 5. here pistil stitch is worked with herringbone stitch, twisted chain stitch and running stitch variations. 7. pistil stitch with Pekinese stitch, I tried lengthening and curving the pistil stitch with running stitch in the last sample. This stitch sampler is thus completed. 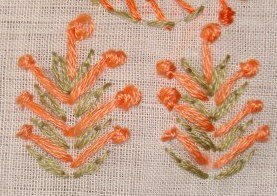 This stitch is an easy and beautiful decorative stitch. I did not explore this stitch very well. 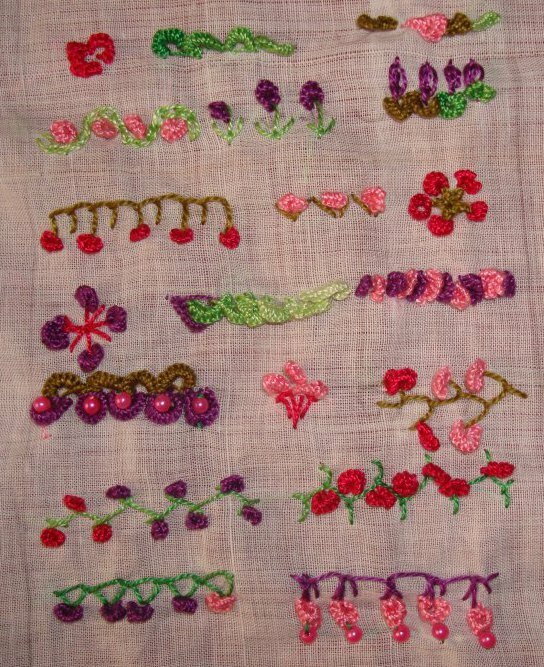 Pistil stitch is the 37th week stitch of the TAST 2012 challenge by SharonB . 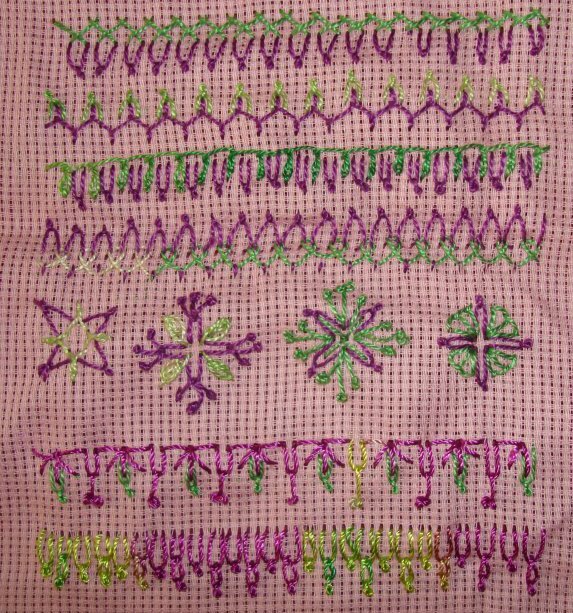 Though , I have not done this stitch before, it is an easy stitch and I enjoyed working on this sampler. 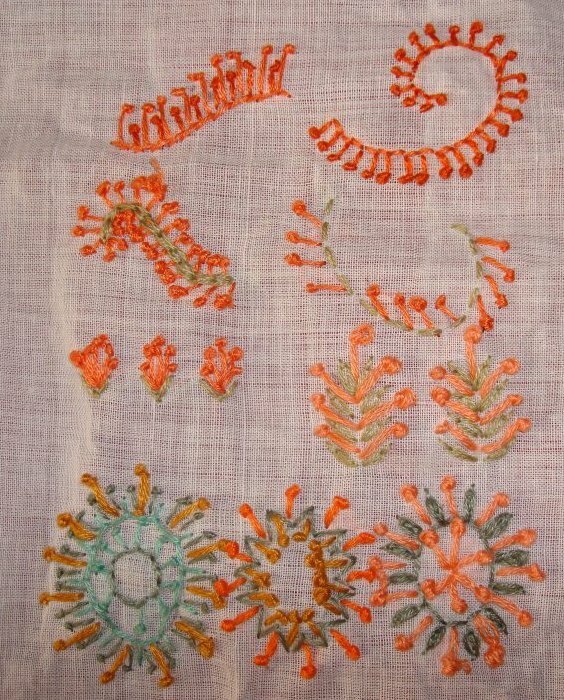 1.Pistil stitch is worked as line stitch with stem stitch, back stitch , chain stitch and running stitch. 2. pistil stitch cluster with fly stitch. 3. detached chain stitch and pistil stitch. 4. shapes worked in pistil stitch with buttonhole stitch, zigzag back stitch and basque stitch. 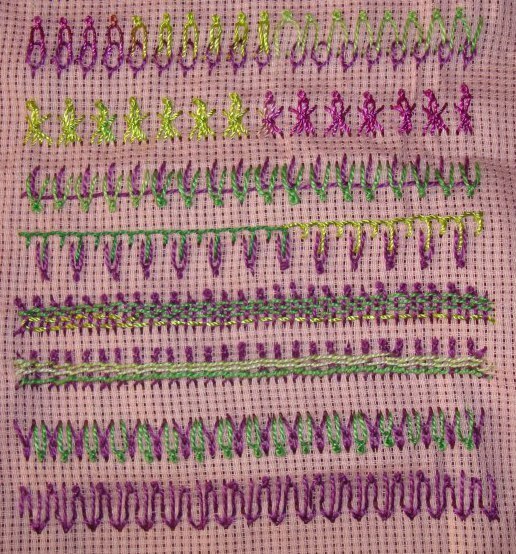 At last I started working on 32nd week’s stitch of the TAST 2012 challenge by SharonB – Cast on stitch. This stitch is really tough, I had zero control over the tension, working, placement on these stitch attempts. 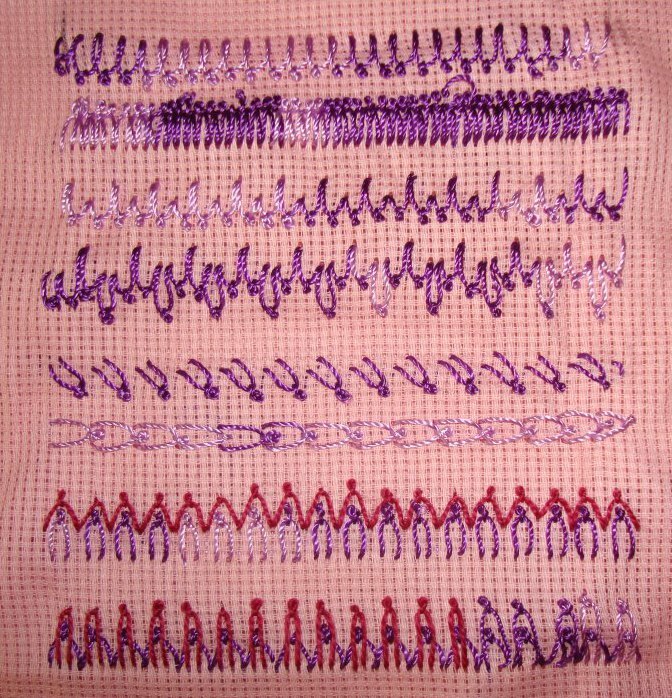 With no idea forthcoming for the stitch sampler, I took an easy way to work this stitch with other stitches, One way to practice this stitch. 1. While working the first three, I had no idea what was going on! 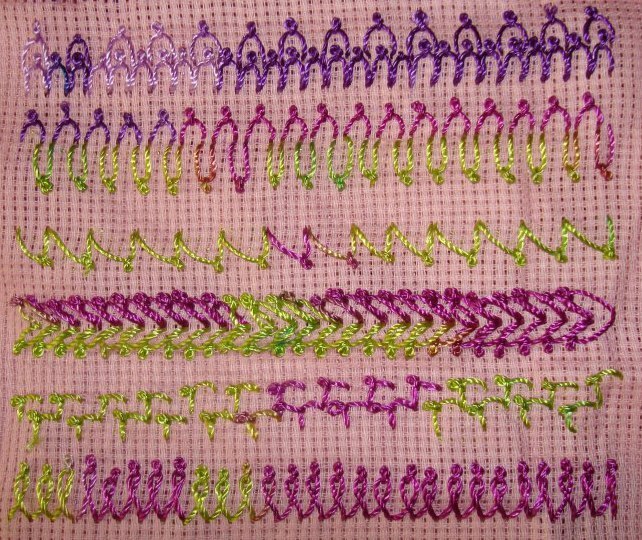 The next few are combined with chain stitch, fly stitch and oyster stitches. 2.The other stitches are buttonhole , zigzag back and whipped wheel . 4.first one is another way to use this cast on stitch. Cast on stitches worked with buttonhole wheel variation and feather stitch. 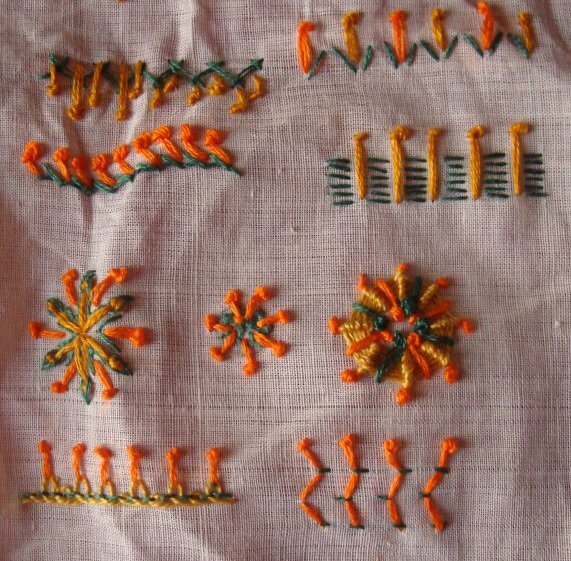 5. herringbone ,Cretan, closed buttonhole and up and down buttonhole stitches are combined with cast on stitches in this part of the sampler. 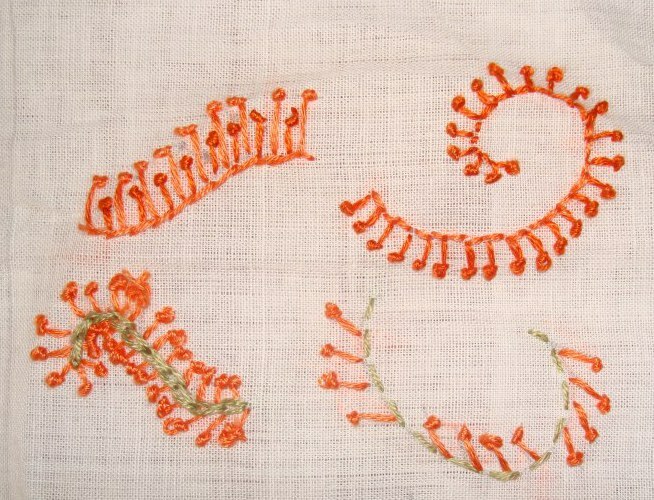 Though it is a wonderful stitch, I need lots of practice to actually use this stitch on any embroidery projects.